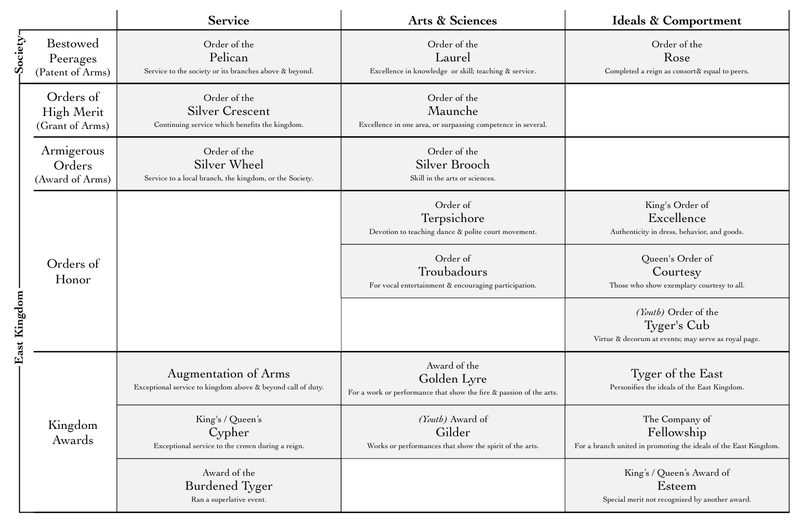 Following a recent discussion of kingdom and provincial orders and awards, I thought I’d try my hand and putting together a visual overview, in part to force myself to wrap my head around all of them, and also in hopes that the result might be of use to others. My point of reference for this was the East Kingdom Awards Overview created by Tola knitýr, which is itself based on a similar chart created for the Middle Kingdom by Gebhard. Rather than just copying the existing chart, I wanted to make sure I understood the underlying awards, but after looking at various write-ups online, it turned out that many of them were out-of-date following a significant reorganization of the East Kingdom award structure that took effect in October 2015. The definitive source of information is Section IX of the Laws of the East Kingdom, which is the governing document that authorizes the current set of awards. 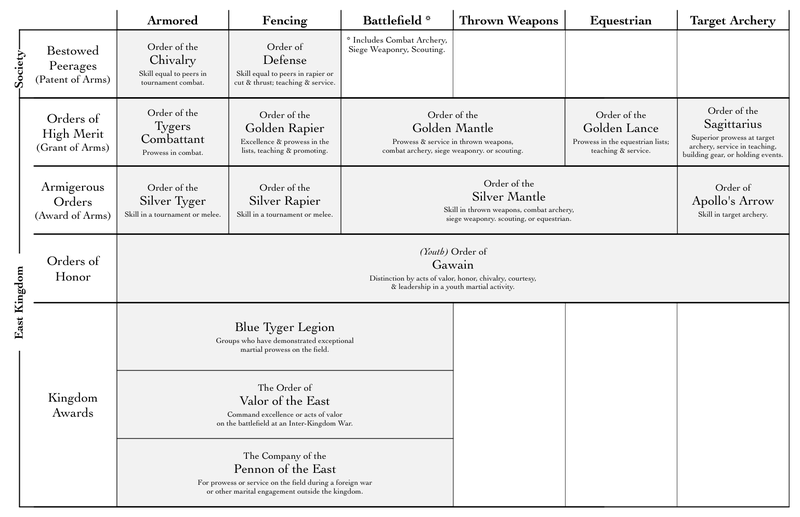 The SCA’s main web site contains a friendlier presentation of that information, and the Awards page in the East Kingdom Wiki has a bunch of useful background information, as well as tangential material like lists of old, now-closed orders. To this I added Østgarđr’s orders and awards. Some of these are described in section IV of the provincial bylaws, although an update will be required to address a few more-recently-created ones that are not yet mentioned there. I filled in the gaps by referring to my earlier writeup of the heraldic registrations for Østgarđr’s orders and awards. The end result of that noodling around is attached as a 2-page, 162KB PDF file. Caveat: this is a draft work in progress, and most assuredly contains some errors. Corrections and other feedback would be welcome. [Update October 5:] I should note that there are a number of historical awards which have been discontinued and orders which have been closed. While these are still recognized, they are no longer granted to new recipients, and they are not included on this chart. [Update October 10:] Thanks to some feedback on the Østgarđr Facebook group, I’ve learned more about a few of the awards and put together an updated version of this chart, now available as a 3-page PDF, or click the images below to zoom in. As noted above, this is a work in progress — let me know if you spot any errors or have suggestions for better ways to present this information!